“KEEP IT HOT” will be the message from Sirane at the Restaurant & Takeaway Innovation Expo as we introduce our thermally-insulated bag range to the market. The Restaurant & Takeaway Expo 2018 takes place at the ExCeL arena, London, from September 25-26 – and it will be Sirane’s first time exhibiting at the show. 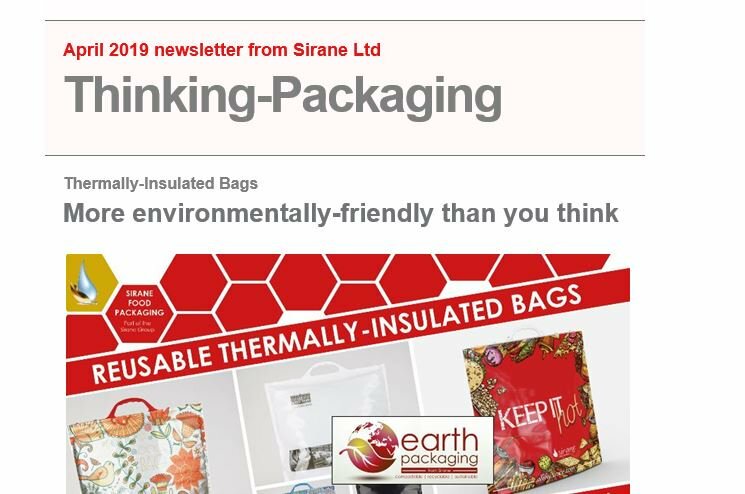 Sirane’s thermally-insulated materials keep chilled food cold – but perhaps crucially for this show they also keep hot food hot – and we can offer bags in a range of sizes. Bags can be digitally-printed, allowing for short runs without the need for set-up costs. Simon Balderson, Sirane MD, said: “Keep It Hot…. that will be our message at the show. Take-aways are as popular as ever, and customers want the food to still be hot by the time they get home. These bags are a great way of making sure that happens. “We’re also introducing an ‘off-the-shelf’ bag under our Keep It Hot brand, customers will be able to buy online from stock – making it a perfect take-out solution. However, we anticipate a lot of customer will want their own brand on the bag – and it does make sense. “They’re great for brand awareness as they are reusable – you could even offer a discount to customers re-using ‘your bag’, and this product is also fully recyclable, and we can even supply it made from a material in which up to 40% of the material has been replaced by recycled materials and sea-shells… so it’s an environmentally-friendly solution. Used by supermarket shoppers and small independent food outlets alike, thermally-insulated bags are a reusable bag ideal for transporting fresh good home, delivery services, marketing and promotion - with many people opting for their own bespoke ‘branded’ bag. Simon Balderson added: “Sirane’s insulated bags come with a unique handle designed to make the bags comfortable for the consumer to carry – they’re the bag your customers will reach for… so why not make sure that your company name is on that bag. “For restaurants and takeaways wanting to send their customers away with hot-food that stays hot, insulated bags could be the answer that you’ve been looking for. A range of other products – including susceptor for crisping food, cooking bags and even absorbent rotisserie liners for hot-food display, will be available on the stand. Simon Balderson, Sirane MD, said: “The Restaurant & Takeaway Expo is a show we’ve visited and thought for a few years might be a good way into a new market. We’ve got lots of products perfect for this sector, and it’s a great opportunity for Sirane. Sirane’s food packaging range also offers a number of other products which should be well-received at the show – and many of which won’t have been seen there before. Sirane’s stand at the Restaurant & Takeaway Innovation Expo 2018 can be found at 2306.